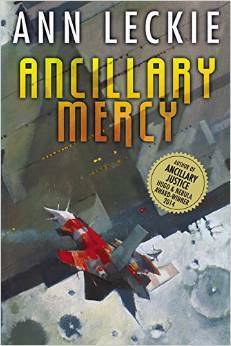 With Ancillary Mercy, I've rated all of the Imperial Radch books around a 3-star rating. This is not indicative of everyone's experience with these books, but I feel that I should have read these books after I read more science fiction. It might have been because of the covers or the hype surrounding these books but I was looking for more of an epic feeling while reading this trilogy. My expectations going into the series was epicness, something that would blow me away, but that is not what these books are all about. These books are all about the interconnectedness of the main character with her subordinates. The large conflict in the story takes a backseat to the relationships that Breq has within the story and maybe it is because of my epic fantasy background, but the focus being taken off the large conflict within this under-utilized world-building, left me wanting for more. These are some well-written books and I always enjoyed reading them but if I had to do it over again I would have waited until I experienced more what the science fiction genre had. I say that because if I experienced other stories like this, a story focused on the subtleness within dialogue, I would have been more prepared mentally to enjoy this trilogy. There is a lot of drinking tea and examining other character's motivations and allegiances in this story and even though it is done well, it never excited me. I do think I'll reread this trilogy in the future with more of a focus on the subtle aspects of the dialogue and the characters they pertain to, but I think during this reading I was overwhelmed with the necessity of a focus on dialogue I am not used to in my readings. Sign into Goodreads to see if any of your friends have read Ancillary Mercy. 22.12% "Dual wielding this book, audio + physical. I should not have taken such a long break in between books. Complex, unfamiliar sounding names and long breaks does not go together." 61.82% "The interpersonal relationships in this book are fascinating due to some characters being AI and the structure of the military." I hadn't really thought of that. But... I guess this can count toward your reading books like this to prepare you for future SF that is similar! I have only read the first one so far but I was definitely expecting more action because of all the hype surrounding it. I wasn't too disappointed by the lack of action, just surprised... and maybe actually a little glad because I was expecting it to be more military sf and it wasn't.